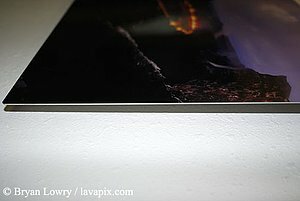 The vibrance, detail, and luminescence of photos printed on metal, along with their durability, makes them ideal for high-end gallery presentations. The ultra-hard surface is scratch-resistant and can be cleaned easily with any commercial glass cleaner. Framed Metal prints are perfectly finished without glass, and delivered display-ready with hanging hardware attached. Priced competitively with Giclee prints on canvas but, much more durable an archival. Below is an explanation of the process. MetalPrints? represent a new art medium for preserving photos by infusing dyes directly into specially coated aluminum sheets. The high gloss coating takes on an almost magical luminescence. Because the image is infused into the surface and not on it, the archival qualities of this unique process are unparalleled. You've never seen a more brilliant impressive print before! Colors are vibrant and the luminescence is breathtaking. Detail and resolution are unsurpassed. Durable archival prints without glass. Easily cleaned with a clean microfiber cloth . I use Isoprpyl alcohol sprayed directly on the cloth for stubborn stuff. 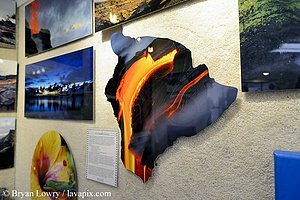 New Big Island of Hawaii shaped metal prints. Images printed with the MetalPrints process will last for generations when displayed indoors and out of direct sunlight. Like any fine art print, MetalPrints should not be exposed to direct sunlight or high outdoor temperatures. MetalPrints have an additional benefit over gicleé or photographic processes in that they are waterproof and have an ultra-hard scratch resistant coating. The archival value of a print should be judged not only by its resistance to degradation by U.V. light and ozone exposure, but also to moisture and surface damage. When these factors are brought into the equation, MetalPrints are an excellent way to preserve an image. Please note: MetalPrints? are printed on aluminum that has a coating applied with state of the art coating machines. The coating that is applied sometimes contains some small imperfections such as small craters or bumps. We inspect each sheet very carefully and if there are imperfections we place them in the most unobtrusive parts of the image. We cannot remake MetalPrints due to these imperfections unless they are located in a very prominent part of the image. MetalPrints are weatherproof and moisture proof, but they will fade like a normal photograph, so please avoid direct sunlight.